As the Federal Reserve reported most recently two weeks ago, US consumer non-mortgage debt has never been higher: as of December 31, 2017, US households had a record $1.0 trillion of credit card/revolving loans, a record $1.3 trillion of auto loans, and a record $1.5 trillion of student loans. Among these, credit card and auto loans, in particular, have been experiencing accelerating delinquencies. As a result, finance companies/banks have been increasing bad debt provisioning to build balance sheet reserves due to expectations of rising defaults. The chart below illustrates the highest reported net charge off rates (NCOs) in years. 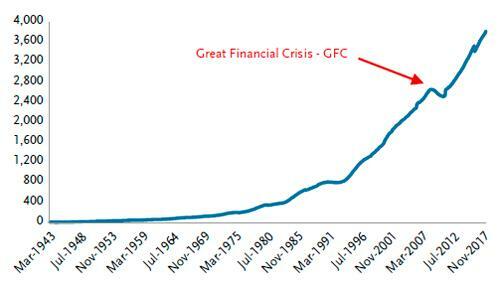 And while all major credit card companies and banks are experiencing increasing credit costs from the trough of late 2015, one would be remiss to spot this at the aggregate level. 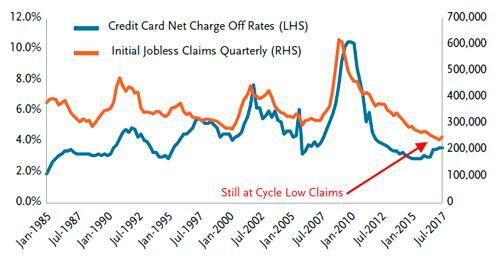 As the chart below courtesy of TCW, which illustrates modestly rising net charge offs (i.e. defaults) for the entire U.S. banking universe, NCOs increased from a trough in 4Q15 at 2.9%, which coincidentally was the same quarter the Fed executed its maiden interest rate hike of this cycle, albeit very modestly. Why the very gradual increase in aggregated NCO, and thus why the lack of economist concerns about the state of the US consumer? 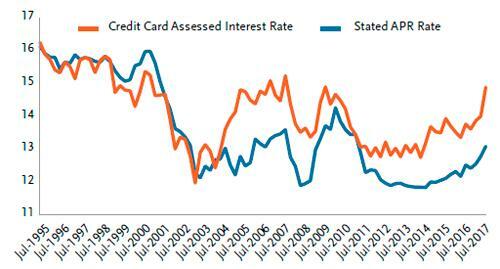 Simple: the larger U.S. banks that dominate credit card issuance have focused on prime and super prime consumers post the Great Financial Crisis (GFC), and have enjoyed a prolonged period of low charge off rates concurrent with the Fed’s almost decade long ZIRP. However, since 2015 the Fed has progressively raised interest rates from ZIRP while NCOs at the larger banks have started to rise, albeit off a low base. NCOs were 3.6% at 3Q17, closing in on a 4% rate, a level that matched the end of previous business expansions in 2000 and 2008. And here a startling discovery emerges. As TCW's Chet Melhotra notes, it is America's smaller banks - those not in the Top 100 by asset size - that have experienced in just the recent months a surge in charge off deterioration, which at 7.9% is on par with the last financial crisis! In other words, to find where the next consumer credit crisis hides - and will erupt next - ignore the big banks and focus on the smaller ones. Oddly, this spike in net charge offs among smaller banks has gone largely unnoticed by the general media which has traditionally focused on aggregate numbers and also the largest banks. 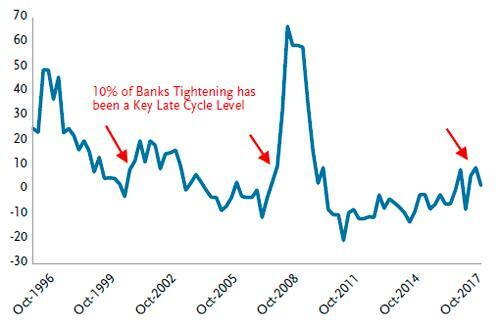 So, as TCW asks, "is this a precursor to larger banks experiencing much higher loss trends as well or just anomalous?" Time will tell: there is a possibility that the larger bank NCO rise be just another midcycle phenomenon pulled forward by Fed hikes such as in the mid ‘90s, while the small bank NCOs will stabilize and even revert. The problem is that while the above observation would be easy to dismiss in world of declining, or flat, interest rates, the Fed's current tightening posture leads to substantial risks of even greater NCOs and defaults as a result of ever higher debt servicing costs, especially if Jay Powell hikes rates 4 more times in 2018 and more in future years. As TCW points out, rising interest costs and lower credit standards due to stiff competition have resulted in higher credit costs. Even unsecured personal loans have seen rising credit costs, as FinTechs and non-traditional sources of credit have consolidated loans for consumers. Consumers consolidated borrowing but turned around and re-levered with new refinancing capital instead of prudently de-levering. In response, banks have materially tightened their “credit box” or underwriting standards per the Fed’s SLOO Survey. Recently, nearly 10% of banks reported tightening credit card lending standards, ironically the same level that ended the last two business expansions. Will this just be another spurious correlation? It remains to be seen, but at the very least it sends a shot across the bow to the consensus thesis of unshackled consumer strength, further amplified by the recent passage of the Tax Cuts and Jobs Act (“TCJA”) aka the Trump Tax cuts. credit costs started to rise in 2016. Most of the increase was initially attributed to “growth math” by card-issuing company executives. This is a seasoning phenomenon that occurs when loan growth rates increase and weaker borrowers default. As newer and weaker front-book pools become a larger share of portfolios, the overall NCO rate rises, and would then be expected to fall after the seasoning effect. Recently lenders have been tightening standards, and high growth pool NCO rates are expected to taper. The problem with the growth math thesis is that now even seasoned back-book vintages are posting rising NCO rates. This is a result of normalization of credit which is less idiosyncratic and more a function of economic factors and consumer stress. But first some background: credit card assessed interest is the annualized ratio of total finance charges to the total average daily balances against which the charges were assessed, as defined by the Federal Reserve. In 3Q17 the assessed interest charge jumped to 15%, levels similar to previous business cycle peaks. This jump may be a result of a maxing out process of the consumer as late fees, cash advance and over-limit fees increase and customers tend to borrow more on their credit cards as a last resort. The higher assessed rate could also encapsulate an incremental mix shift within weaker subprime and private label cards. The spread between the assessed rate and stated average APR rate, which largely reflects Fed rate hikes, is widening. 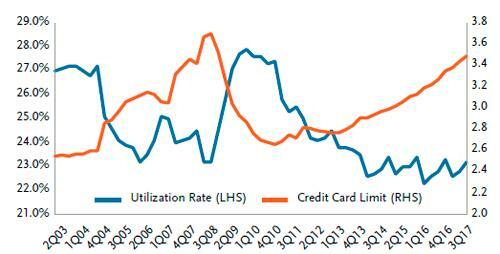 Industry credit card limits of $3.5 trillion are close to the previous 2008 peak while utilization rates are still low. But why are consumer credit costs rising in a benign economic environment? 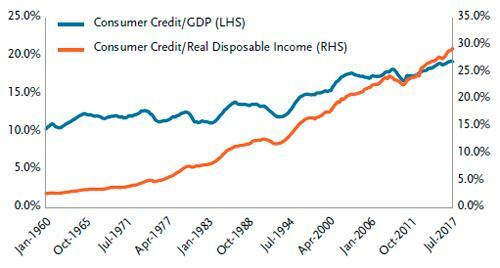 Indeed, as shown above, consumer credit costs have been dramatically rising in an economic environment characterized by tepid economic growth over the last two years. Full year 2017 Real YoY GDP growth was +2.3%, accelerating from +1.5% in 2016, while unemployment is at trough levels of 4.1%. 1. Decelerating Jobs and Weak Wage Growth: Employment growth has decelerated over the last few years, wages have been growing at a subdued 2-2.5% rate, while the costs of rent, healthcare, food and other living items have been rising at a faster rate. 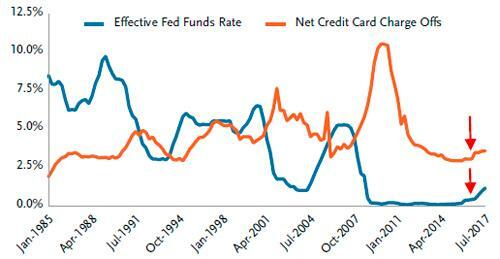 As a result, the savings rate has been declining with new spending financed with more credit borrowing. 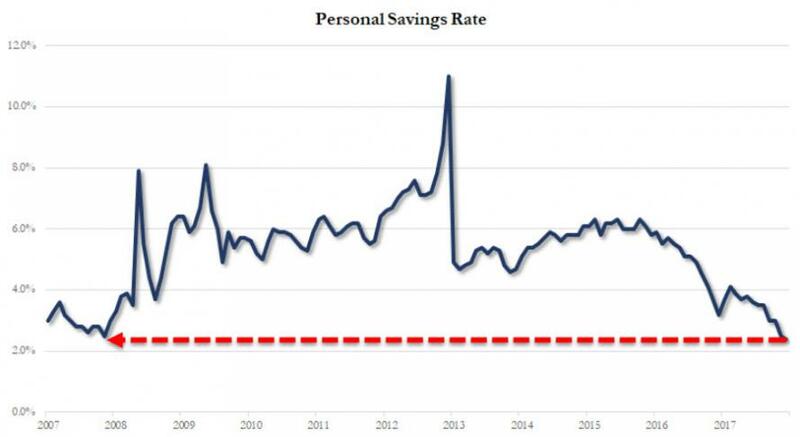 In fact, the personal savings rate has been surprisingly poor this entire cycle, and recently dropped to just shy of all time lows. The CEO of Assurant, Inc. (insurer of mobile devices) recently stated in 2017, in talking about the U.S. consumer: “The reality is half of Americans can’t afford to write a $500 check.” This speaks to the great wealth inequity in the U.S. exacerbated by the Fed’s ZIRP and QE policy. 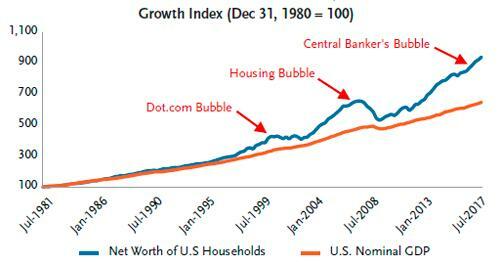 ... and accounting for a record 29% share of consumer real disposable income and 19% of nominal GDP. To be sure, "drowning in debt" is hardly equivalent to the image of a strong, stable, confident US consumer. 3. Fully Loaded Financial Obligation Ratio Trending Higher: The U.S. Consumer Financial Obligations ratio has fallen since the GFC, given lower mortgage balances and lower interest rates. However, upon including healthcare costs the Financial Obligation Ratio increases dramatically making it more difficult to service debt. Meanwhile, as underlying credit trends deteriorate, the Fed is hiking rates, leading to even higher delinquencies and Charge Offs. The Fed rate hike cycle, begun in 4Q15, has been increasing consumer debt service costs while measured wage growth persists. As a result, NCOs have risen and the Fed continues to increase interest rates at a rapid pace. The rate of change of the Effective Fed Fund’s Rate off a low absolute base is an important determinant of weaker consumer credit metrics, as most consumer debt is keyed off the front end of the yield curve. Separately, US consumer confidence is currently soaring to levels not seen since close to previous peaks in financial and economic markets. This may be due to the fact that household net worth to disposable income is at an all-time high of 673% or 2.9 standard deviations above its mean since 1951. Worse, as shown in the chart below, the gap between household net worth and the tangible income economy continues to widen to unprecedented levels. As TCW reminds us, the last time we saw this movie the argument was similar to today’s: The equity market was acting as savings for the consumer in the Dot.com Bubble, while the Housing Bubble obliged almost a decade later, abrogating the need for thrift. History hasn’t been kind to this kind of bubble logic. Today, the discrepency within aggregate household wealth has never been more skewed. The majority of households don’t have the wherewithal to participate in the Fed’s wealth effect, and as such bear the brunt of financial stress. 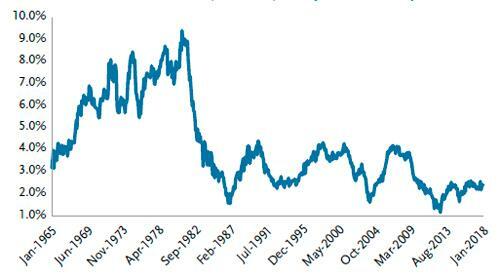 However, as noted above, what is especially disconcerting is that this cycle peak in wealth and confidence is being accompanied by a plummeting savings rate. Consumer Confidence vs. 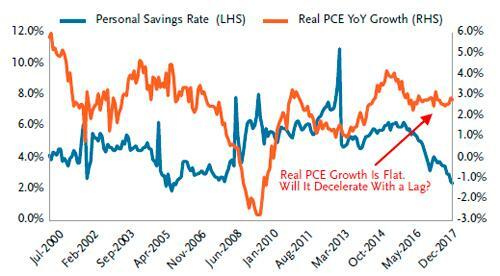 Personal Savings Rate Confidence Outpunting Coverage --> PCE Declines? This as TCW colorfully puts it, "is akin to consumer confidence out-punting its coverage in football parlance." 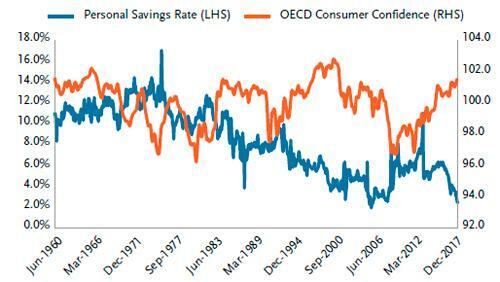 Historically, when consumer confidence is robust in the face of a plummeting savings rate, personal consumption expenditures (70% of GDP) typically roll over thereafter, as shown in the chart below. Given the weak savings rate and jump in leverage the consumer seems vulnerable to further interest rate hikes. 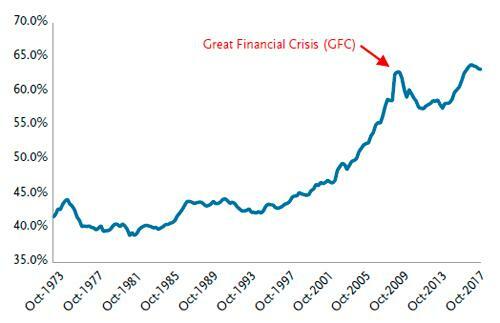 So now that we know of a festering locus where American credit deterioration is especially acute - smaller US commercial banks, those not in the Top 100 - and we have observed a substantial deterioration in broader credit trends, the biggest question outstanding is could credit costs accelerate substantially from this point on? To address this key question, TCW notes that Jobless claims recently printed at a 45-year low of +216K and have been lower than the key level of +300k for the last 43 months. 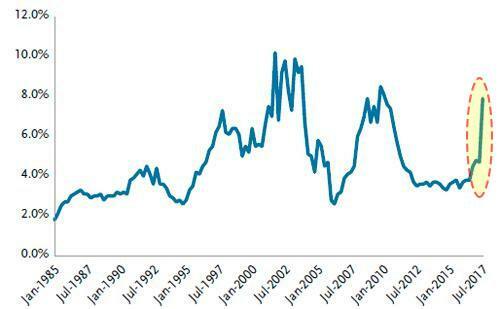 Claims are now 1.6 standard deviations below their historic mean since 1967. This is important as there is a 67% correlation between claims and card NCOs. This means that if claims mean revert at some point, consumer NCOs should increase, possibly dramatically, given tight historical correlations. 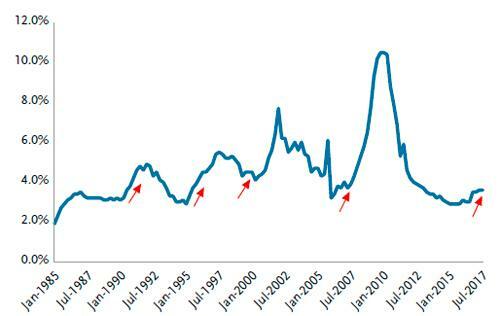 In conclusion, TCW believes there is significant potential that consumer NCOs and credit stress may continue to increase, exacerbated by a levered consumer, tightening lending standards, stretched financial obligations ratio, and an aggressive Fed rate hike cycle – but not necessarily in a straight line. In addition, the Fed’s draining of bank reserves as part of its balance sheet reduction plans should make consumer access to liquidity incrementally more difficult over time, as overall monetary aggregates correspondingly decelerate. At the very least, the asset managers warns that the consensus party lines that “Subprime credit costs are contained” because “This time is different” should be met with skepticism. We believe the aforementioned adages may not age as well as “I’m tapped out Marv. American Express got a hit man lookin’ for me” as we move through the twilight of this seasoned and levered credit cycle. For now, however, to find the inflection point, keep an eye on net charge offs at smaller US commercial banks: that's where the next consumer credit crisis will begin.